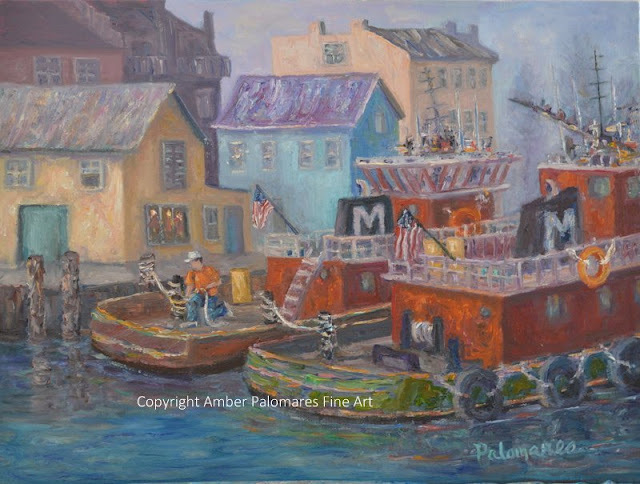 The delightful coastal oil painting was inspired by the docks in Portsmouth, New Hampshire where you can find Moran tugboats. I like to do research on my subject matter, and I especially needed to do that regarding this subject matter. I found out that many tug boat workers have lost their lives when rescuing ships and boats. In my research, I came across a story narrated by Tom Hanks about how the tugboat and other boat operators rescued 300,000-500,000 people off Manhattan Island during 9/11. I was amazed that I had never heard of their heroic efforts. It is truly an unforgettable film that will show how Americans pull together in times of need. It was heartwarming to see the response by the boat operators.